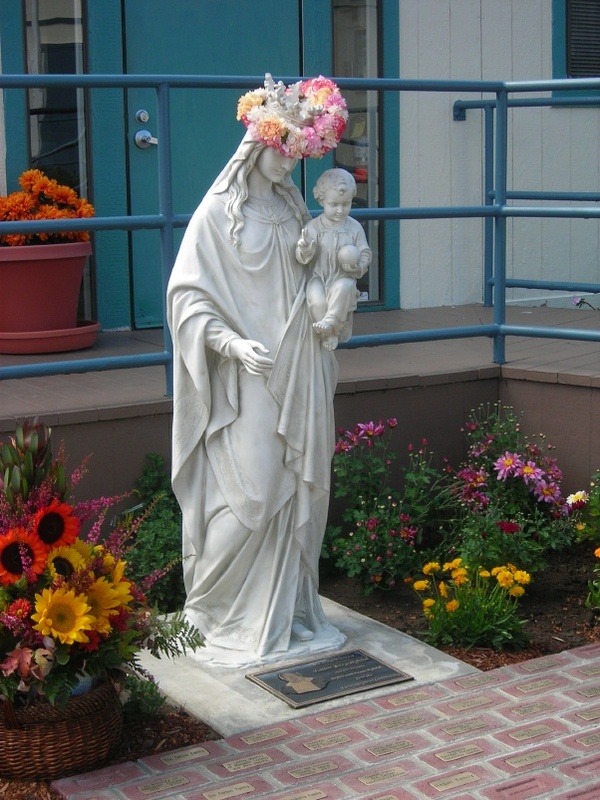 I took this photo on 20-June-2009 at Holy Cross Cemetery in Colma. 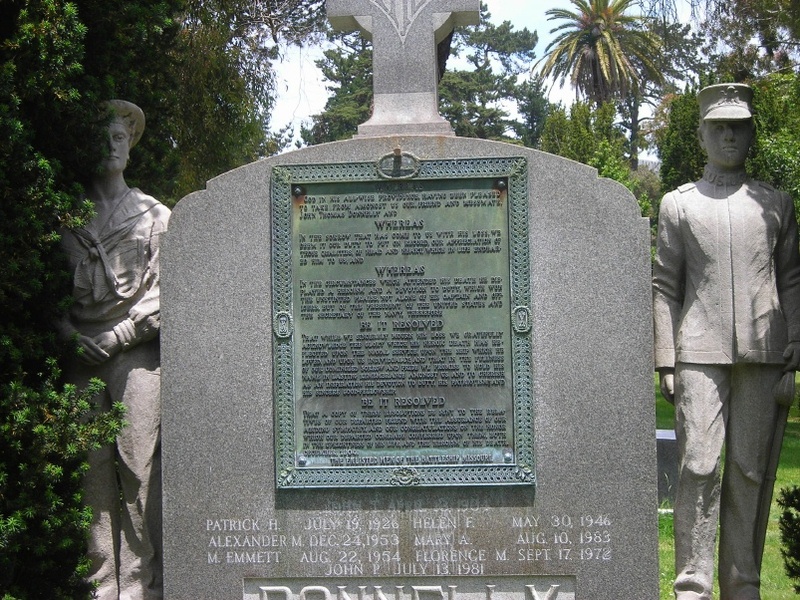 It shows the monument to John Thomas Donnelly, who died on the battleship Missouri on 13-April-1904 when a charge ignited inside a turret during target practice and suffocated 36 men. 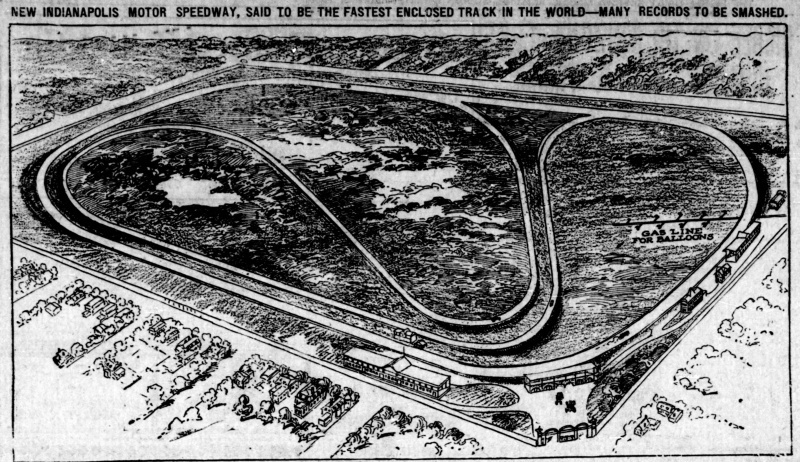 This view of the new Indianapolis Motor Speedway appeared in the 02-May-1909 Bisbee (Arizona) Daily Review. We are watching the Indianapolis 500. Today we did the walking tour we donated for the Good Shepherd School auction/dinner dance. The family had three kids. Nice people. The weather was remarkably warm and sunny. We did not go as far as usual because they had to get to an appointment. After they headed back, we went on to the fortune cookie factory, then had lunch at the Irish Bank. I've been looking forward to that. We went to 5 o'clock mass at Good Shepherd. We were eucharistic ministers. Next week will be the last week for masses in the church. Then they'll fix the floor and we'll have mass in the gym. 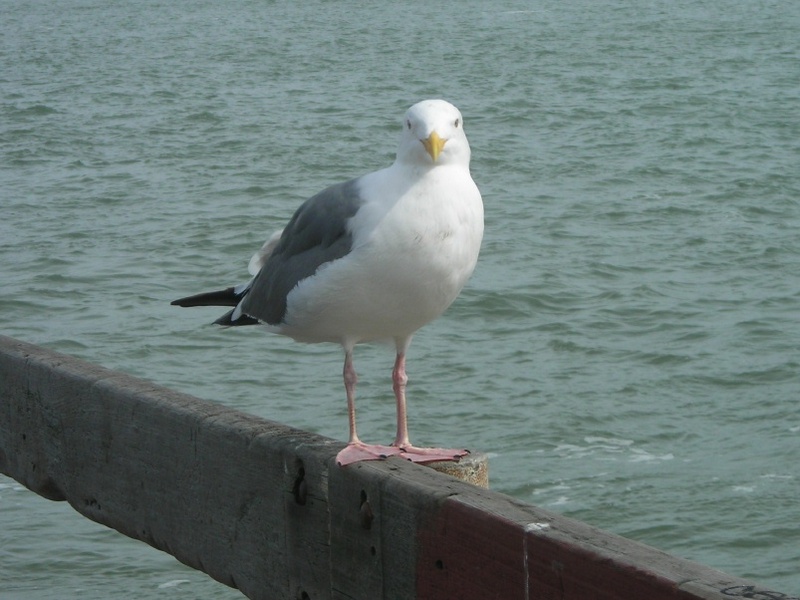 I took the photo of Charley the Seagull (Two-Legged Charley) on 05-March-2010 behind the Ferry Building. From the 27-January-1895 San Francisco Call. WA Coulter did many maritime drawings for the newspaper. This one shows the new protected cruiser Olympia, built by San Francisco's Union Iron Works, which went on to a distinguished career in the New Navy. Olympia served as Commodore Dewey's flagship at the Battle of Manila Bay. Olympia still survives, serving as a museum ship in Philadelphia. Charleston was the Navy's first protected cruiser. Protected cruiser San Francisco served the Navy until 1937. Monterey was a monitor. On the outbreak of the Spanish-American War, battleship Oregon sailed 14,000 miles from San Francisco to Florida and arrived in time to participate in the battle of Santiago de Cuba. I like the ram bows on warships of this period. Cruiser Olympia Is Formally Delivered. Will Be Ready for Business in a Very Short Time. LATEST TRIUMPH OF THE COAST. In Another Month the Handsome Flagship Will Be in Condition to Meet All Comers. Uncle Sam has taken unto himself a new cruiser, which is the greatest in strength, speed and armament yet turned out by the Scotts. The Olympia is now at Mare Island, where she went yesterday to be formally turned over to the Government. The Pacific Coast has been wonderfully successful in turning out fighters for the white navy, and the Scotts look with special pride on their last product, yet they have a strong and lingering affection for the Charleston, which was their first experiment, and which has seen more real service up to date than any other member of the new navy. She has been in the atmosphere of wars, if not an active participant, all the way from Rio de Janeiro to China, and has been of incalculable benefit to our commerce in foreign ports from a moral point of view. The San Francisco was a somewhat larger enterprise, which was also a success, and then came another experiment in the shape of the coast-defense vessel Monterey, and that has fulfilled all expectations. The Olympia is the fourth jewel in the diadem of the Union Iron Works, or rather the "fourth one of our babies," as Irving M. Scott puts it. Soon the great battle-ship Oregon will be ready to go into commission, and then the Pacific Coast alone will have turned out a navy that could have destroyed all the war vessels of the North and South employed in the recent rebellion in very short order. 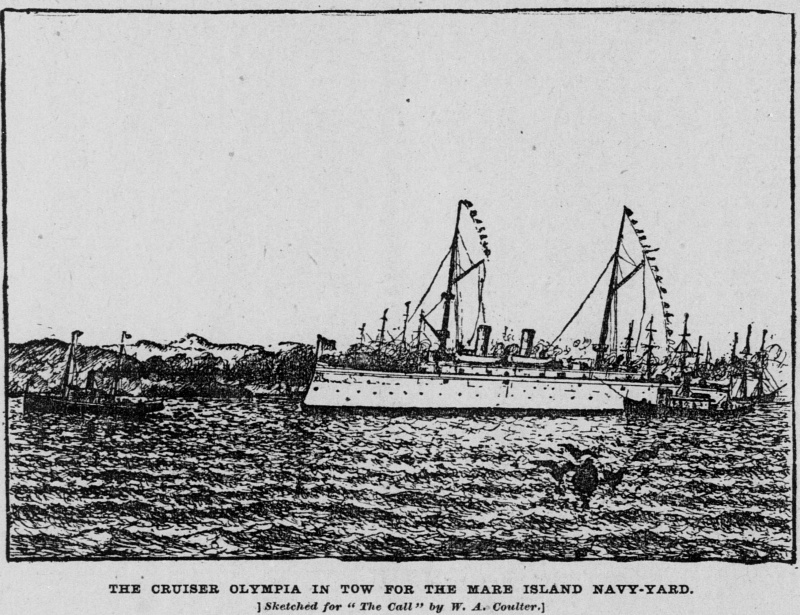 When the Olympia was about to be taken from her moorings at the iron works there was quite a little crowd present, as well as a delegation of naval men from Mare Island. The cruiser looked as clean as if she had just come out of a bath. Her brasswork glowed under the bright rays of the sun, her decks were clean enough to eat from, and the six and eight inch guns had been burnished and housed with their neat canvas covers. It required three big tugs to take the monster on her journey to the navy-yard. The first to lay hold of her was the Vigilant, which swung her head out and towed her clear of the wharf, when the tugs Active and Alert fastened on to either side. It was rather a queer sight to see the three little fellows grappling with the glittering white fighter, which was so helpless without men or steam-power. She took her departure amid the blowing of whistles, huzzas of spectators and the waving of handkerchiefs. The three strong tugs fairly scooted along with her through the water, passing in quite close along the wharves, where she was greeted with other salutes. 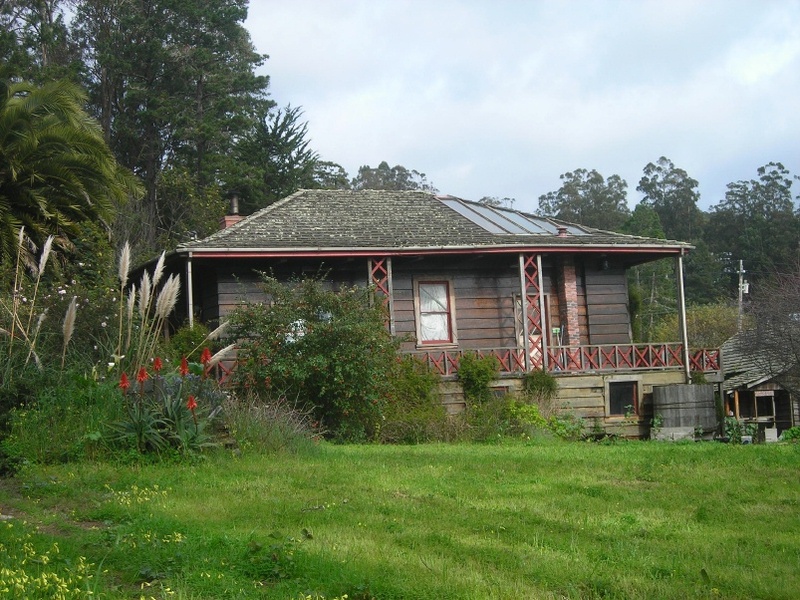 A run was made in the direction of Alcatraz, and the course taken thence to the yard, where it is expected she will be able to go in commission within about a month. This is provided the requisite crew of 280 men can be secured, and that will be a hard matter, as the 6000 men allowed the navy by act of Congress are all employed. She may have to wait until 2000 more are allowed by an act which is now proposed. Update 04-June-2010: The organization that takes care of Olympia, the Independence Seaport Museum, is threatening to sink her as a reef or scrap her because they cannot afford to give her the maintenance she needs. Olympia has not been drydocked for over 60 years. The Friends of the Cruiser Olympia (http://www.fotco.org/) are trying to raise money to save her. I took the photo on 06-May-2010. It rained hard today. While I was on my way home, BART was running late because of equipment problems at Daly City. 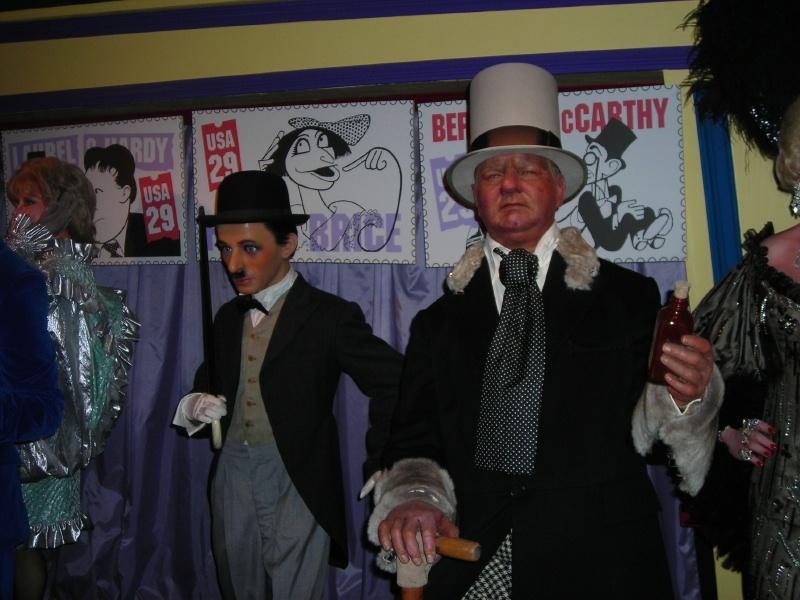 Charlie Chaplin and WC Fields at the at the San Francisco Wax Museum, 04-August-2007. Chaplin was the greatest comedian and director and writer and everything else in silent movies. 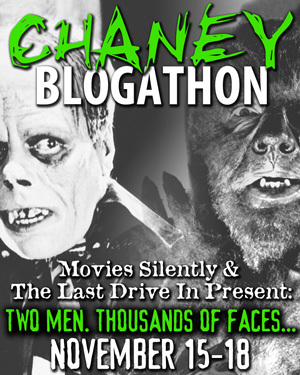 And sound movies. WC Fields started in vaudeville as a juggler and worked his way up to the Ziegfeld Follies. 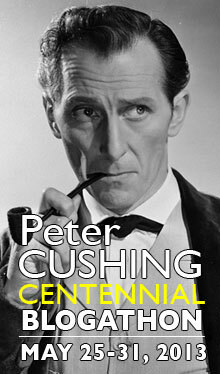 His film career began in silent movies, but sound allowed him to bloom. It was very windy and cold today. We were going to do a walking tour today, but one of the people we were going to take got sick. We headed downtown anyway and parked at Fifth and Mission. We took a walk out Kearny to Portsmouth Square and then up to the Fortune Cookie Factory. We walked back on Stockton, through the tunnel and on to Macys. I dropped the cookies off at the car and met them back at the store. They shopped a bit and then we went down Stockton and dropped off their purchases. We had lunch at AG Ferrari on Mission, then went to the Cartoon Art Museum. I wanted to see the Batman exhibit before it closes in early June. They had a copy of the original artwork from Detective 27, Batman's first appearance. 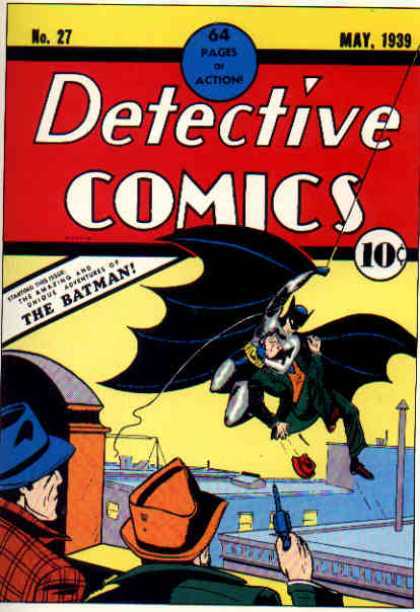 The cover of Detective 27 is from a wonderful site called Cover Browser: http://www.coverbrowser.com/. They also had scenes from The Dark Knight, Digital Justice, and Year 100. There was a new exhibit on Mort Walker and Beetle Bailey. I never paid much attention to it in the Sunday paper and then after Hearst took over the Chronicle, but I remember its occasional controversies. I liked one where the Sargeant yells at a Private for shooting a machine gun at a deer and tells him never to do anything so cruel again. "This is meant for people." The third exhibit was about Ed Hannigan's covers for DC and Marvel. He has MS and the show was helping to raise money for him. I put something in the box. We went from there across the street to the California Historical Society to see the Think California exhibit. I particularly liked the painting "Larsen's Chicken Farm, 19th Avenue, San Francisco." There were sections on different themes like people coming to California, California's abundance, and our expositions. We went to 5 o'clock mass at Good Shepherd, for Pentecost. Now Easter season is truly over. 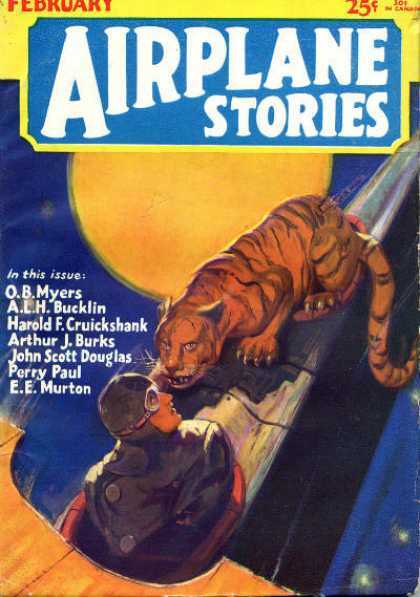 The image is from a wonderful site called Cover Browser: http://www.coverbrowser.com/. 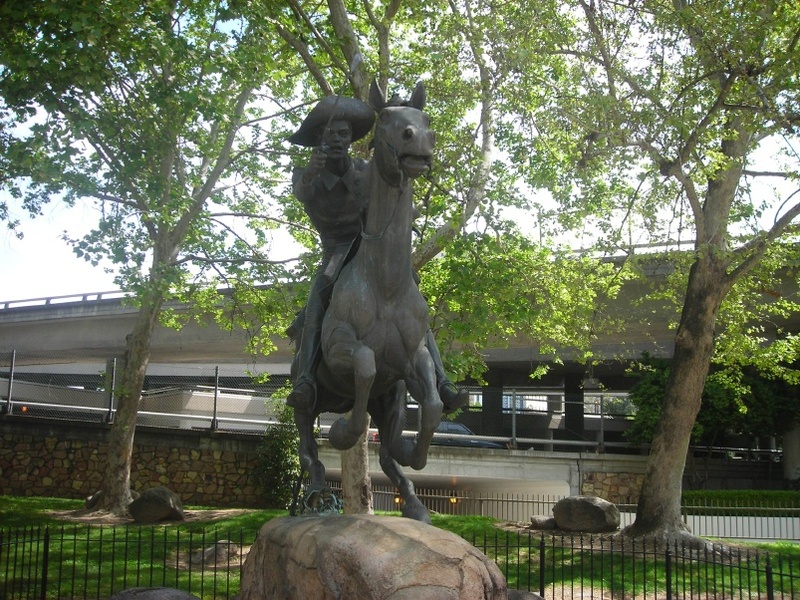 With people celebrating the 150th anniversary of the Pony Express, I thought it worthwhile to post a photo of Thomas Holland's Pony Express statue in Old Sacramento. It was dedicated in 1976. I took the photo on 17-April-2010. 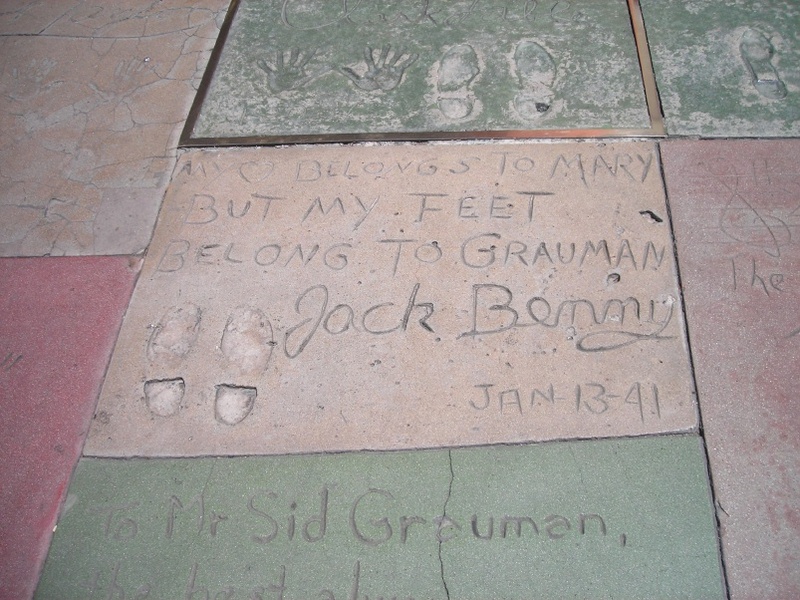 Jack Benny, star of stage, screen, and radio, left his footprints in the forecourt of Grauman's Chinese on 13-January-1941. 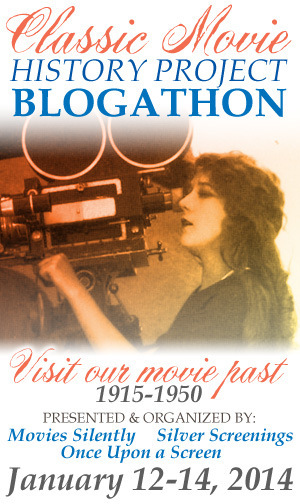 "My heart belongs to Mary (his wife, Mary Livingstone) but my feet belong to Grauman." I love his radio show. DSCN4146. I took this on 18-July-2009. It was muggy all day and it started raining lightly at lunch time. From our friends at the Jejune Institute (http://www.jejuneinstitute.org/). 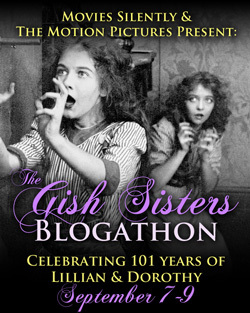 Be sure to click on the photo to see a larger version. 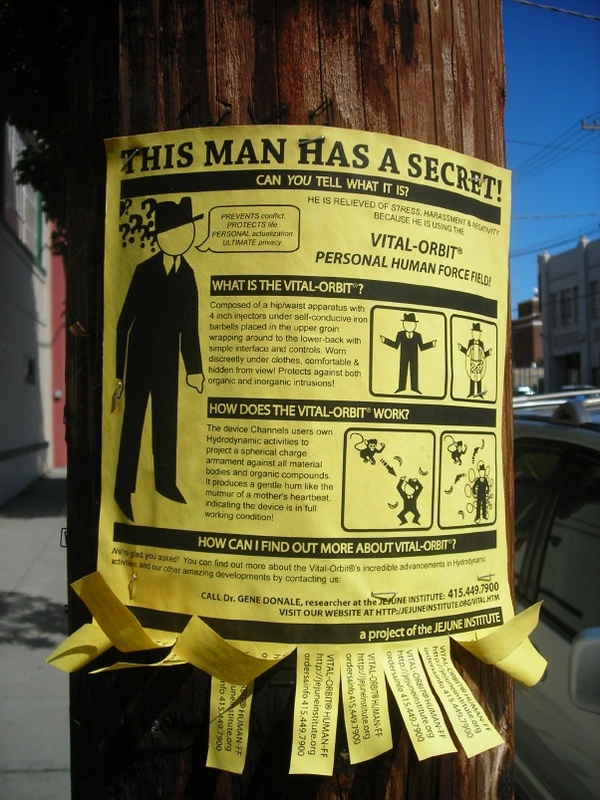 Spotted on Third Street on 10-March-2010. I took the photograph on Howard Street on 12-May-2010. We went to see the Giants play the Astros. We parked at Fifth and Mission and then took Muni Metro to Folsom. A crane was doing some work on a fireboat. We had lunch at Red's Java Hut. Before the game, the weather was cold and foggy. Then it got warm and sunny. Today was Till There's a Cure Day. 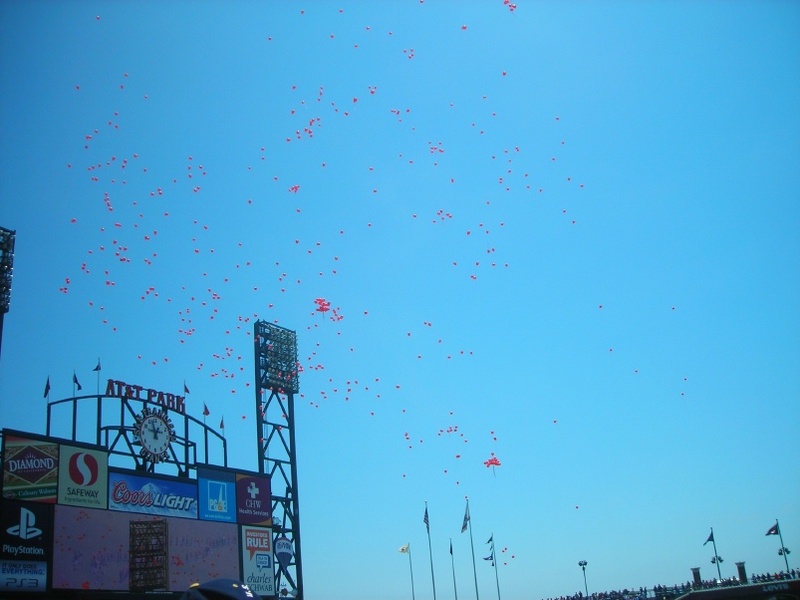 A bunch of people with balloons formed a ribbon on the field, then let them go. Lincecum won 2-1, but Brian Wilson made things exciting in the 9th by walking a bunch of people. We stopped at Good Shepherd on the way home and went to mass. 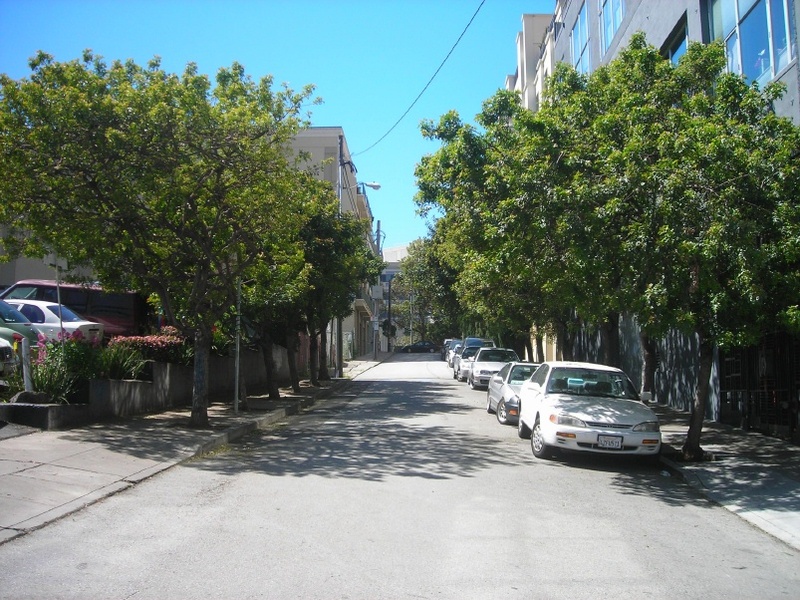 Lansing Street, from First Street, up on Rincon Hill. I took the photo on 07-April-2010. I like railroad heralds. 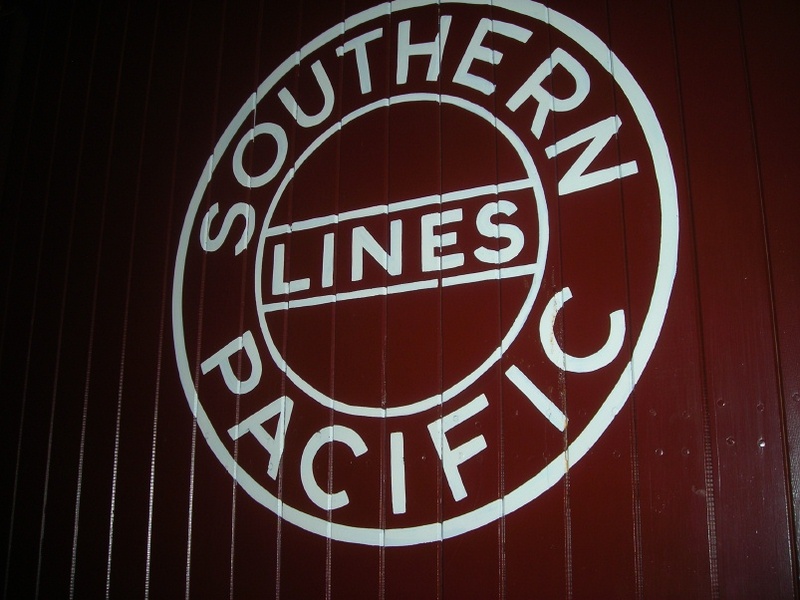 Here is Southern Pacific's classic herald from narrow gauge boxcar 331 at the California State Railroad Museum. 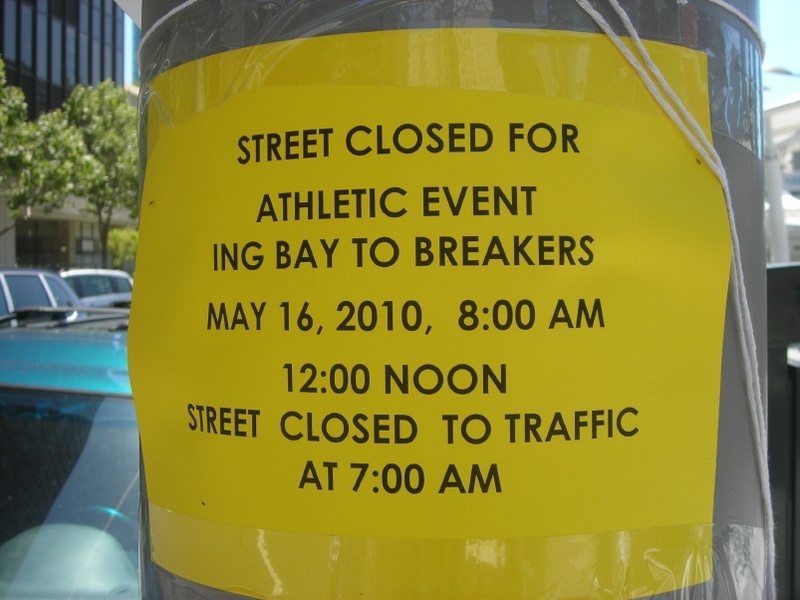 I took the photo in April, 2010. This item, from the Sunday, 16-January-1881 New York Sun, describes a lecture he was going to give that night on the Photophone. I assume that this was Alexander Graham Bell and Charles Sumner Tainter's 1880 invention, which used a beam of light for wireless sound transmission. When I was a kid, I saw a woodcut of the Photophone in an old National Geographic article on Doctor Bell and was fascinated. The image comes from the first installment, in the February, 1893 issue of Manufacturer and Builder. Lecture by P H Vanderweyde on "Photophones" before the Polytechinic Association Cooper Union Thursday evening. 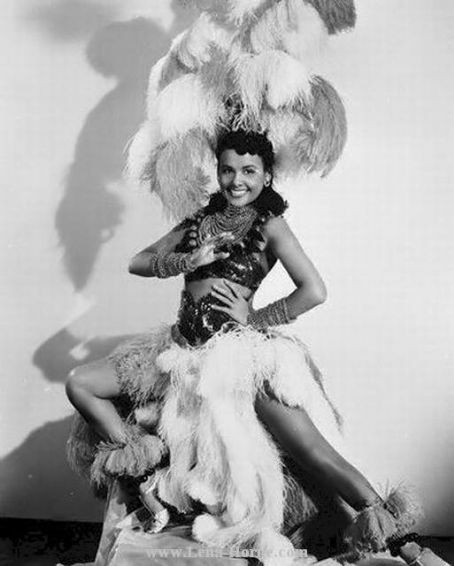 Lena Horne died. She was a dancer, a singer, a Cotton Club vet, a civil rights pioneer, a classy lady. The Harvard and the Yale were fast steamers brought from the east coast by the Pacific Navigation Company to operate between San Francisco and San Pedro, the port of Los Angeles. They sailed the route from 1911 until World War One and 1921 until 1931, when Harvard hit rocks near Point Arguello and sank. The effects of the Great Depression and competition from autos and railroads caused LASSCO to stop service with the Yale after 1936. 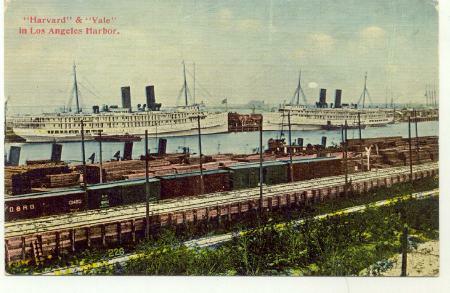 Both ships carried troops to Europe during WWI and Yale served the Navy during WWII. 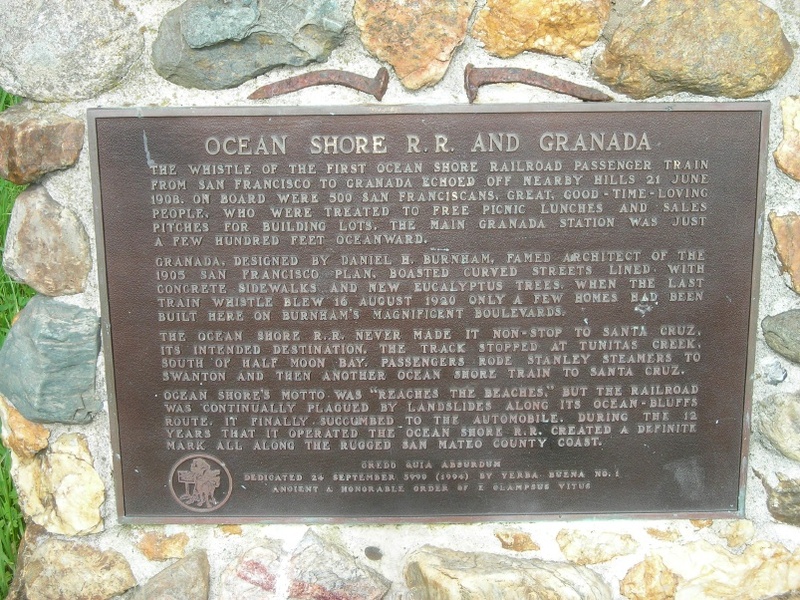 The Ocean Shore Railroad has been gone since 1921. Granada Station in El Granada was moved up the hill from its original location and made into a house. An E Clampus Vitus placque marks the original site. Note the spikes. Happy Cinco de Mayo everyone. 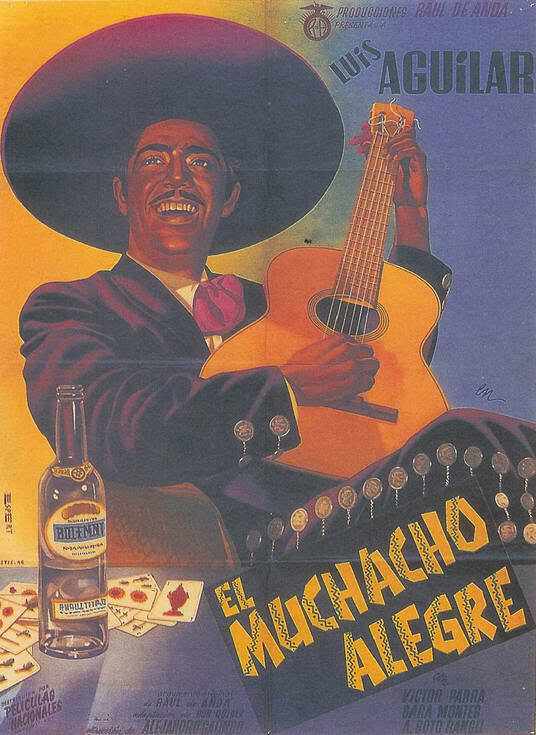 I borrowed the Luis Aguilar poster from the wonderful blog If Charlie Parker Was a Gunslinger, There'd Be a Whole Lot of Dead Copycats (http://tsutpen.blogspot.com/). 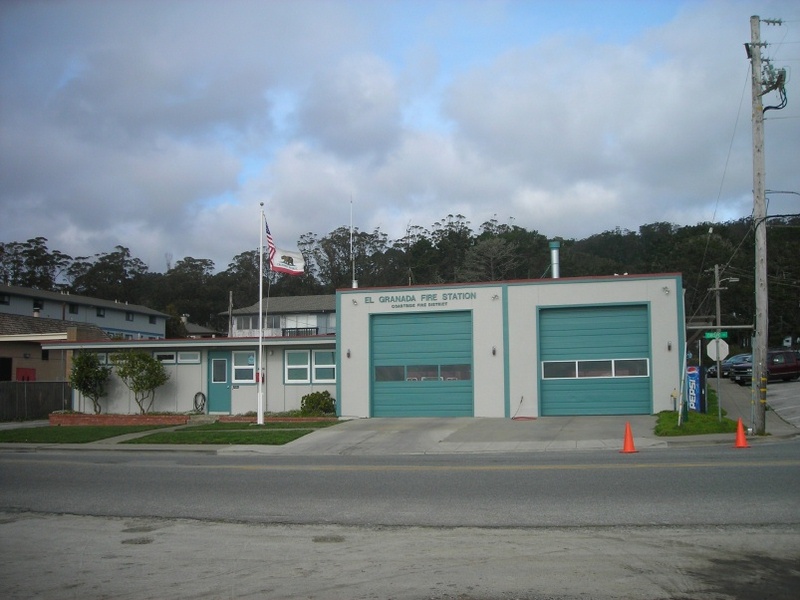 Station 41 of the Coastside Fire Protection District in El Granada. I took the photo on 08-February-2010. The battery in my car died. I had it replaced at Miller-O'Brien. I worked from home the rest of the day. 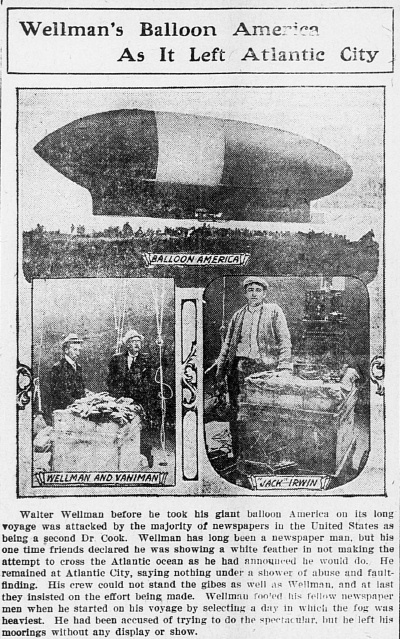 Walter Wellman had tried to fly a dirigible to the North Pole. 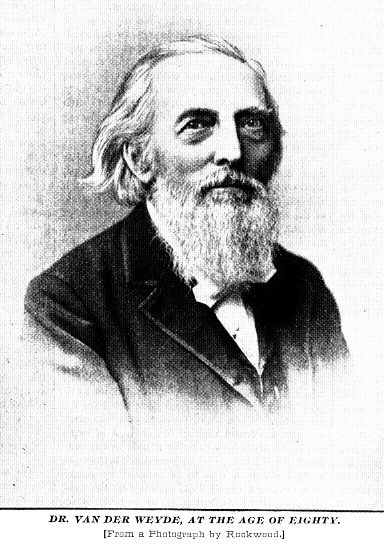 Dr Frederick Cook, to whom Wellman was compared by some, claimed to have been the first to reach the Pole, by sled, but was widely believed to have made it up. Wellman's equilabrator, a device that trailed in the water, intended to help the ship maintain altitude without expending gas or ballast, did not work. 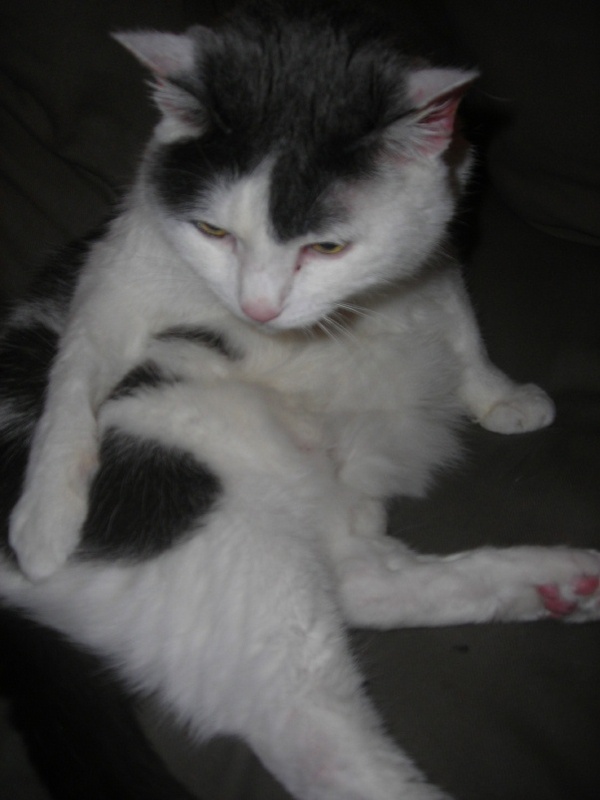 Wellman was forced to ditch near Bermuda, but his crew, including a cat, were all rescued safely by a passing ship. 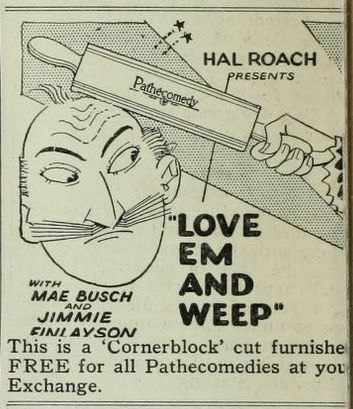 The image and story are from the Palestine (Texas) Daily Herald, 05-November-1910. 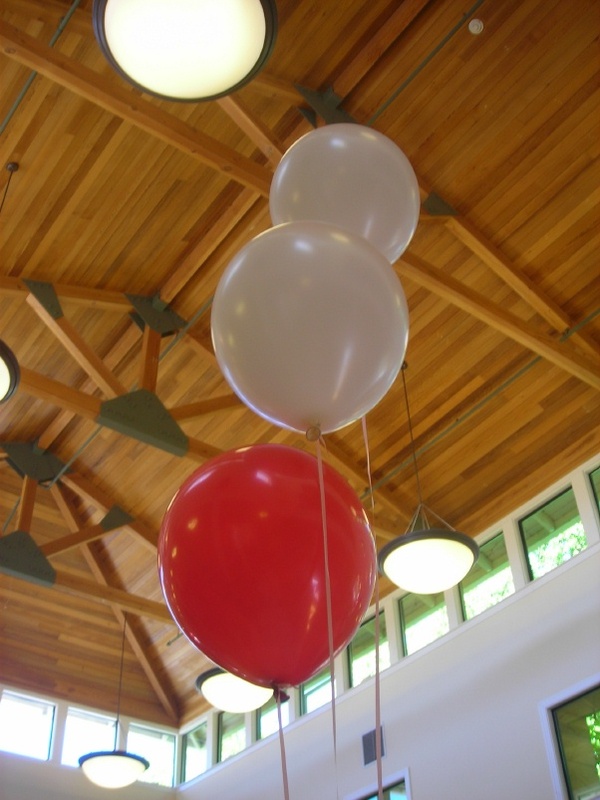 We went to a nice First Holy Communion party in Union City. Lots of wonderful Indian food. Nice people. It was very warm. When we got to Pacifica, it was foggy. We went to 5 pm mass at Good Shepherd. It turns out that the flood was not caused by vandalism, just a problem with the plumbing. We'll have mass in the gym for a month starting May 18 while they repair the floor.